India is undergoing a pleasant art attack. This month, Mumbai made room for two new art spaces—Gallery BMB, to showcase contemporary work, and Osian’s retail area at Vama for Indian art memorabilia. The capital city catches up with CMYK, a bookstore dedicated to art and design. CMYK is centrally and strategically located in Mehar Chand market, which happens to be right behind the India Habitat Centre (IHC). So you can meet up with your date, and browse through handsome volumes on art before heading for a show at the IHC. An initiative by Roli Books, this is the first in what might turn out to be a nationwide art and design book chain. 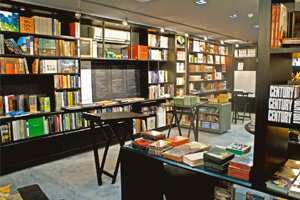 Apart from Roli’s own publications, the store hosts an impressive collection of titles from reputed international publishers such as Phaidon, Thames and Hudson, Taschen, Abrams, Black Dog and Leventhal. The shelves hold everything that is loosely connected with art: photography, performing arts, architecture, travel, erotica and gourmet cookbooks. Visitors can pick up a book, grab an espresso (free, we have to add) and lounge on the terrace upstairs. The best thing about top-notch bookstores are the nooks that allow you to sit and browse through a book from which you only want one Thai curry recipe or a Rodin reference for your next art paper. CMYK is a relatively small space. Though it makes up for this loss by having a terrace upstairs, Delhi’s extended sultry summers mostly rule out that option. Hardcover art books necessarily cost more than fiction. The cost of a book at CMYK averages Rs2,000 but stationery by the in-house brand, Designwallas, and Roli’s cute pocket art series—Complete Works of Manjit Bawa, Satyajit Ray at Work, etc.—come for Rs150. The most expensive book in the store right now is Later Chinese Painting and Calligraphy by Robert Hatsfield Ellsworth, priced at Rs35,000. What’s fantastic is Roli Books founder Pramod Kapoor’s instalment payment scheme for those terribly expensive books (the store has books priced at Rs2 lakh coming in) you want but can’t get yourself to to pay for at once. Art on EMI! Fabulous.